the cave story randomizer shuffles the locations of every item in cave story, creating a new experience each time you play! the randomizer has logic in place to ensure that you can always reach every item and finish the game. please read the release notes for more details. right now, i cannot guarantee that every seed will be completable - however, many will be. please be patient while i work out the bugs from this very early release. should you come across any issues, please report them on the issue tracker or @mention me on discord, @duncathan_salt#1179. feel free to @ me if you find yourself stuck and want help! i sincerely hope you enjoy. i have spent 2 weeks straight working on this project so far and i look forward to it getting better and better. thanks for reading, and thanks for playing. On the day where I have to work all day, too... Guess I'll be having something to look forward to! I'm really excited to try this baby out! I've only played a small portion of this so far, but I really appreciate how this brings out the...non-linear-ness of Cave Story. This became almost immediately apparent when I first went for the Egg Corridor, didn't acquire the ID Card, almost thought I was stuck, but then realized I could just go to any area I wanted. It was a lot of fun trying to figure out where to go next based on the items I had rather than going through the usual areas in the original Cave Story plot. Was dying just by looking into Santa's fireplace intentional? I wasn't sure, since I did have the jellyfish juice, and I knew you were supposed to obtain an item there. I assume this is because there's some sort of item that I'm not allowed to obtain yet due to not progressing to that point in the story or not having another certain item first. I wish the mod would indicate that, though, if this is the case, rather than just straight up killing Quote. If it's because you're not supposed to look in fireplaces, couldn't this have also been said, too? I basically stopped playing (for now) once I managed to get myself locked in a loop. It was in the Hideout, where I had the Controller, Booster, but didn't have the Sprinkler yet. When I talked to Momorin, she kept saying, "Bring me a Booster, Sprinkler, Controller..." then it ended with her saying "#0206" before looping back to the beginning of that dialogue. Guess I should have gotten the Sprinkler first, oops. Spoiler: The #0206 cuts immediately after it's displayed so this is the best I could get in terms of screenshots. But yeah, I'll definitely be checking this one out more once I have time; it's a cool idea that's executed well so far (save for the above two points). I will say that the abridged versions of some events and dialogue made it feel slightly inconsistent with some moments that had their normal text scrolls, but it was more because I was inspecting a lot of stuff, including things that weren't necessarily important to the original game. Even just moments like the fast save disk versus the fade/wipe of the screen once you exit a door did seem a little strange once I got used to the quickness of certain actions. Overall, I will say that my run has currently gotten me to experiment with the Snake more, and that's something I haven't done in a normal Cave Story playthrough in a very long while. Want to use my ORGs in your mod? Here's my complete archive! I am so glad this exists. 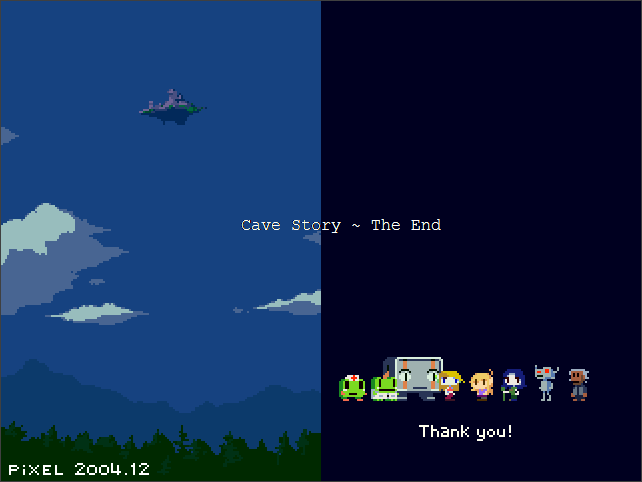 The seed I used may have gotten very tedious near the end just to save Sue and Curly prior to going in the Last Cave, but after getting the third ending, I really felt satisfied from playing it. While there are some bugs that I had to bypass in a couple parts, I am also extremely happy that I finally get to save Curly in the Core room after beating the Living Waterway, something that I had dreamt of way back during my first playthrough in 2012! I haven't felt this happy to reach the end screen for so long, I totally recommend this to anyone who is reading the thread! Ok, HOW DO I DO THIS AGAIN? @MyBoi Open the exe file in the Randomizer folder of your download, and then drag the data folder from the Cave Story folder of your download onto the window. 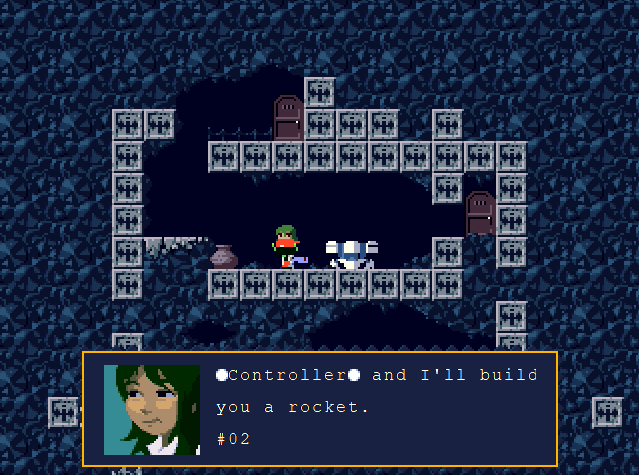 Once you do that, drag the brand new data folder in the Randomizer folder into the Cave Story folder. Windows will ask you if you want to overwrite the files - say yes, and then once the copy has been performed just open up cave story and start a new game! oh and am i suppsoed to get the beast fang?? lastly does anyone know how to break down that barrier to the balcony? Thanks for that, sorry for the uppercase, was kind of missing a readme file.